For a while now at IISC, we’ve referred to the above definition from Chrislip and Larson’s work, Collaborative Leadership, to describe the goal of our collaborative capacity building work. And it has informed our approach around supporting social change networks. However, over the past couple of years some of us have been looking more critically at this definition, not with the goal of altering it per se, but of expanding what we uphold as a vision and options for collective movement for change through a network approach. And we are hardly the first on the scene in this regard. A part of this critique stems from what can feel like very “process heavy” approaches to networks, that ultimately do not deliver on the promise of nimbleness and innovation. Furthermore, if we are able to engage real diversity with a network approach, the expectation that everyone will move in lockstep anytime soon is probably unreasonable. Cooperation, I would say, is more about “parallel play” than all playing the same game at the same time in the same way, albeit with some common shared prupose. 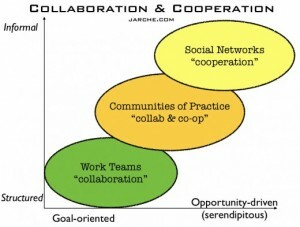 Jarche and others point out that collaboration is only part of working in networks, and that cooperation is also necessary. To be clear, the networks to which he most often seems to refer are virtual knowledge sharing networks. At IISC, we are focused on networks for social change or “action networks,” and many that are place-based. That said, not all action can or should happen by committee, and to be sure, networks for social change benefit from knowledge sharing and creation. Furthermore, there is evidence that doing everything together can privilege certain kinds of thinking and ultimately play to a lowest common denominator. I was once asked impatiently by a network “design team” member, “Do we really have to agree on everything here? Can’t we just let a thousand flowers bloom?” My answer was that it’s not so much an “either/or,” as a “both/and.” There is a need to better discern where to draw the lines between cooperation and collaboration and to make space for both. On what must all network participants agree? 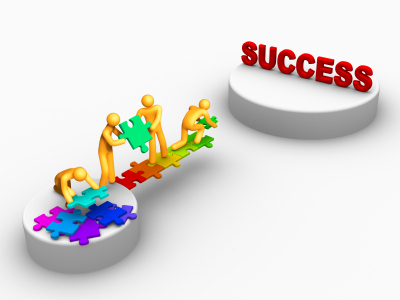 When is it most strategic for all or most network participants to coordinate around a given action? When and around what is it best to keep things diffuse and self-directed? All of this said, I think that a big challenge to formally holding on to both collaboration and cooperation in social change networks is the drive to measure and control for outcomes. On the latter, there is likely internal work to be done to loosen our grasp and become more comfortable with necessary and unavoidable messiness in the form of self-organization and space for emergence. On the former, I am excited by the potential of new platforms, such as EASE, to visually capture and aggregate collaborative and cooperative outcomes. Seeing more outputs and outcomes holistically and at different levels (whole group/network, sub-group, “twosies,” individual network members), will be a great aid in deepening and broadening what we value, create, and deliver in networks. Really important distinctions. It’s helpful to have language to describe what’s possible when everyone isn’t doing the same thing together at the same time. 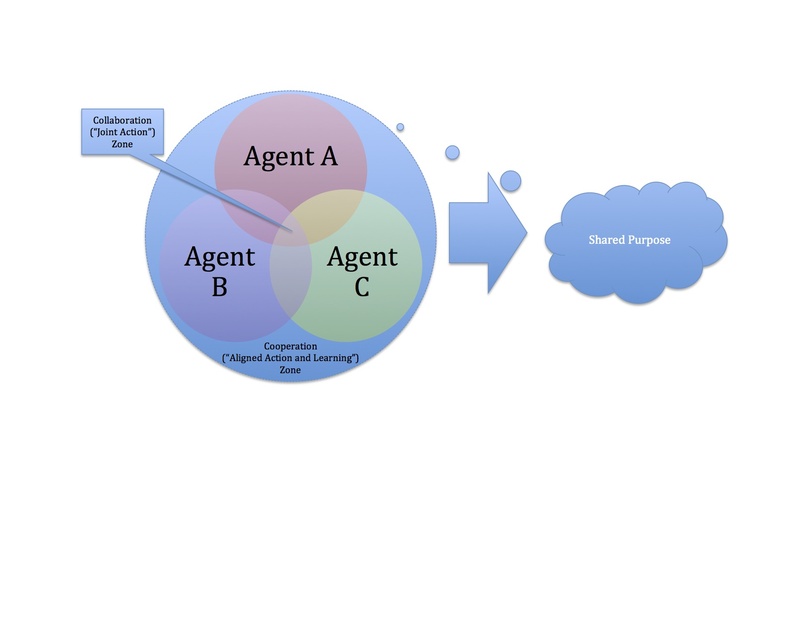 Referring to the Jarche diagram, I think there may even be a fourth bubble, where people are not so much cooperating as doing parallel play that is moving in a similar direction but without even the intention of actively working with others. I agree with you Curtis that the definition of collaboration you mention comes more from the perspective of two parties working together than the more complex networked ways of working that are emerging. There are multiple dimensions to this new style of collaboration, here a few: 1) “court vision” – learning and having an ongoing awareness of how you fit in the larger system of people/organizations working toward a common goal; 2) aligning work – this relates to collaborating; though I see it including a dimension of seeking out unique roles as part of a larger coordinated effort; 3) sharing learning, sharing info, network weaving – all these small and big ways we can collaborate to help a whole network be more effective. We tend to drive toward a set of actions the network can do in a more collective or centralized way; however, with intention and the right tools that enable self-organizing I think there are lots of ways we can help “flowers to bloom” in terms of participants collaborating with each other. Thanks, Beth. I like that notion of “court vision” quite a bit, and this is where I think some of these new and emerging tools could be helpful in creating more of that shared and ambient awareness of the whole.